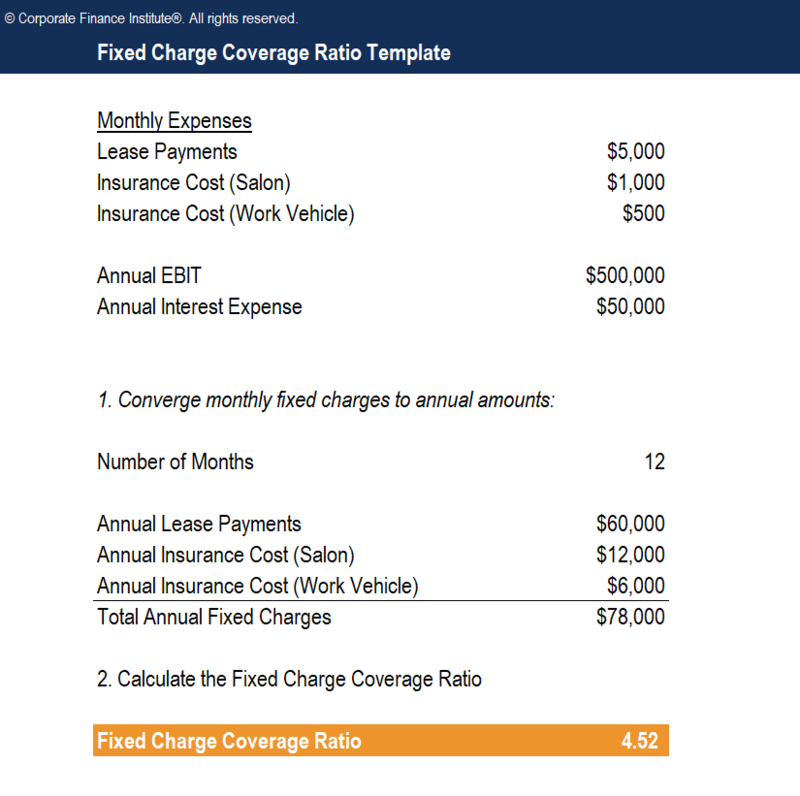 This Fixed Charge Coverage Ratio Template will show you how to compute the fixed charge coverage ratio using annual expenses and EBIT figures. The Fixed-Charge Coverage Ratio (FCCR) is a measure of a company’s ability to meet fixed-charge obligations such as interest expensesInterest ExpenseInterest expense arises out of a company that finances through debt or capital leases. Interest is found in the income statement, but can also be calculated through the debt schedule. The schedule should outline all the major pieces of debt a company has on its balance sheet, and calculate interest by multiplying the and lease expensesOperating LeaseAn operating lease is an agreement to use and operate an asset without ownership. Common assets that are leased include real estate, automobiles, or equipment. By renting and not owning, operating leases enable companies to keep from recording an asset on their balance sheets by treating them as operating expenses.. The FCCR is a broader measure of the times interest coverage ratio, more complete by virtue of the fact that it also includes other fixed costsFixed and Variable CostsFixed and variable costs are important in management accounting and financial analysis. Fixed costs do not change with increases/decreases in units of production volume, while variable costs are solely dependent on the volume of units of production. This guide teaches an analyst the fixed vs variable cost methods such as leases and insurance. As with other commonly used debt ratios, a higher ratio value – preferably 2 or above – indicates a more financially healthy, and less risky, company or situation. A lower ratio value – less than 1 – indicates that the company is struggling to meet its regularly scheduled payments. The FCCR is used to determine a company’s ability to repay its fixed payments. In the example above, Jeff’s salon would be able to meet its fixed payments 4.51 times. The fixed-charge coverage ratio is regarded as a solvency ratio because it shows the ability of a company to repay its ongoing financial obligations when they are due. If a company is unable to meet its recurring monthly or annual financial obligations, then it is in serious financial distress. Unless the situation is remedied quickly, efficiently, and safely, it is unlikely that the company will be able to remain financially afloat for very long.